The Smiths’ breakup in 1987 sent these two creative geniuses their separate ways, but neither has since slowed down much. Marr has made music with a host of artists, including New Order / Joy Division’s Bernard Sumner, the Pretenders, The The, and Modest Mouse. Morrissey continues to tour and record under his own name, even now. I’ve spent more time with the latter’s music, but as this May marks the 30-year anniversary of the Smiths’ first single, “Hand in Glove” on the venerable Rough Trade Records, I thought I’d check in, see how these two have been holding up. To be completely honest, I haven’t really kept up with Marr’s musical output post-Smiths. As mentioned above, I’ve seen his name attached to big-name bands, but I’ve not really tracked particular albums he’s worked on. It’s likely his presence was just overwhelmed by the glare of larger personalities and lyricists also associated those groups. It doesn’t help that each time I thought to seek out Marr’s music, I was underwhelmed. Prior to this year, his cameo on Portlandia (see above) may well be the most notable of the work he’s done – certainly, it’s the most enjoyable of his performances I’ve heard in recent years. Still, I was intrigued when I got word of a new solo Marr album. And when a Minneapolis show date, April 23, was announced as part of his tour schedule, my ears really perked up – definitely marked the date on my calendar. (I figured I should jump on the opportunity; who knows when it’ll come by again? Morrissey has canceled his visits to the the Midwest three times in the last year.) I picked up a copy of Marr’s new album, The Messenger, and I have to admit I’m pleasantly surprised. The record is vibrant, punchy and full of Marr’s distinctive, melancholy guitar playing; but he’s also invoking elements of Brit-pop bands from the 90’s influenced by Marr, like the Verve and Oasis — something I have a major soft spot for. I’ve seen Morrissey perform four times in the last five years, but last week’s show at the Varsity was the first time I’ve seen Marr play — solo or otherwise. 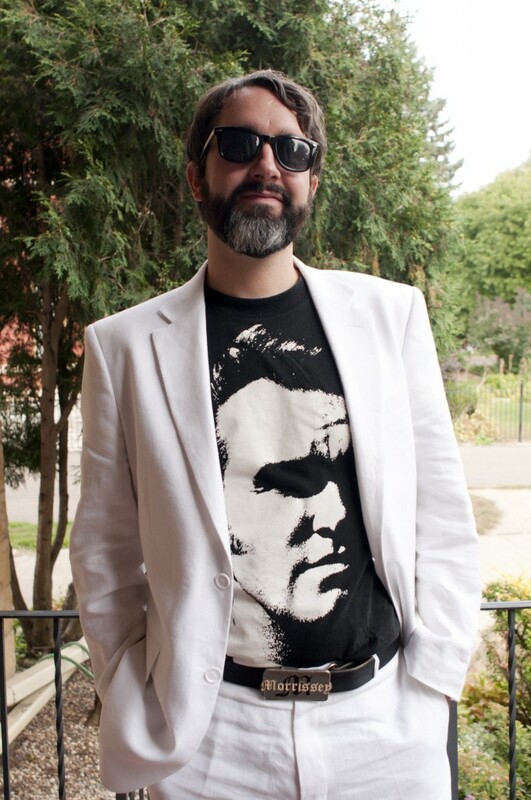 The Morrissey shows I attended were filled with both young and old fans adorned in Smiths and Morrissey attire. I expected to see the same crowd to turn-out for the Marr gig, but I only noticed one young man with his hair coiffed in Moz-like fashion. In fact, Marr’s was an older crowd, one that seemed likely more familiar with the music he made with Morrissey than his more recent stuff. 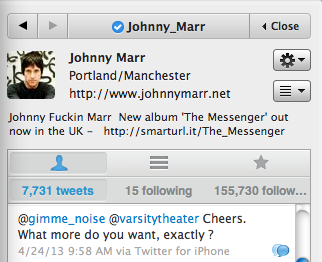 Here’s the deal: Marr put on a fantastic show at the Varsity, but something was missing. It’s clear the musician himself felt otherwise and responded on Twitter to such criticism, asking “What more do you want, exactly?” And maybe he’s got a point. Maybe his past work has set up unrealistic expectations in myself and others. But then there’s this: I may have lost track of Marr over the years, but where Morrissey’s concerned… Let’s just say: I may or may not have named my black and white cat, Moz, after him. A sharp-eyed visitor may also notice an entire shelf in my living room dedicated to a certain English crooner of Irish blood from Manchester. I mean, at this point there are websites, books, and documentaries dedicated to this charming man, and I’ve eagerly consumed all of them. Whilst the BBC tut-tut-tutted a polite disapproval at the Russian government for sending a “feminist punk” band to prison for recording an anti-government song, they engage in identical intolerance against Ding dong the witch is dead without a second’s hesitation. Thatcher’s funeral will be paid for by the public – who have not been asked if they object to paying, yet the public will be barred from attending. In their place, the cast are symbols of withering – as old as their prejudices, adroit at hiding Thatcher’s disasters. Millions have been offered for shows and tours that would reunite the talents of Marr and Morrissey, but I’m content with the idea that it will never happen. The time when these two combined forces to create the Smiths is a moment we’re fortunate to have well documented. Their early songs and records are still here, absolutely still relevant and ready to be enjoyed for generations to come. 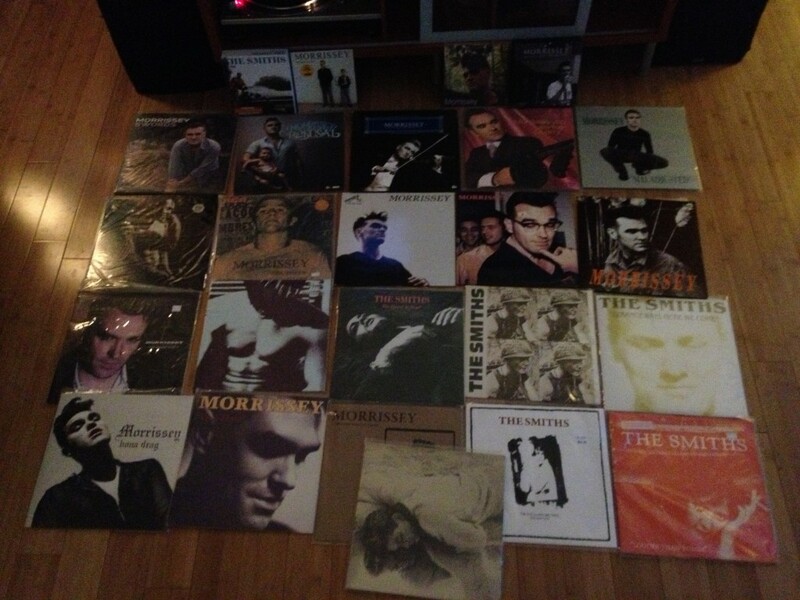 The legend of the Smiths looms heavy over the rest of their careers, sure. But just as important, Morrissey and Marr are still in conversation with music and the world. What more could we want or need? Tom Loftus is founder and owner of the Modern Radio record label, a creative/music event planner, social media consultant, DJ, mini-golf enthusiast and a college career adviser. He has been deeply involved in the Twin Cities music community since the mid-1990s and has attended over 2000 shows across the world in basements, bars, ballrooms and beyond. While not immersed in the world of music, he loves word games, traveling, and his two cats adopted from Pizza Farm.